This was cuts of filet mignon cooked in burgundy sauce with cipollini onions, crimini, button and oyster mushrooms. 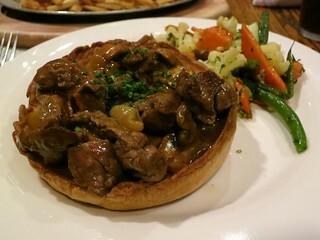 I love yorkshire puddings and I really liked the one here, it's just eggy and fluffy enough. The filet mignon was quite tender also. Pat got the fish and chips ($18), which uses beer battered halibut. It was rather weird at first, but strangely addictive .. couldn't stop eating ..
More cocktails: I also tried the Braveheart with Glenlivet, lemon, ginger, and honey ($11). For dessert, Sticky Toffee Pudding ($7). It was very rich and sweet! I loved it but couldn't eat the whole thing on my own. 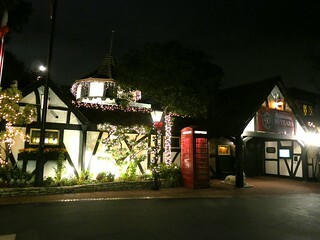 Tam O'Shanter was simply charming and a fun place to hang out. The history and ambiance, the lovable old waiters and managers who have worked there for decades, the fun trivia nights. I don't know why I haven't been here before but I'm glad I visited and will be back with some friends. holy crap - trivia AND sticky toffee pudding! i smell a date night coming up!